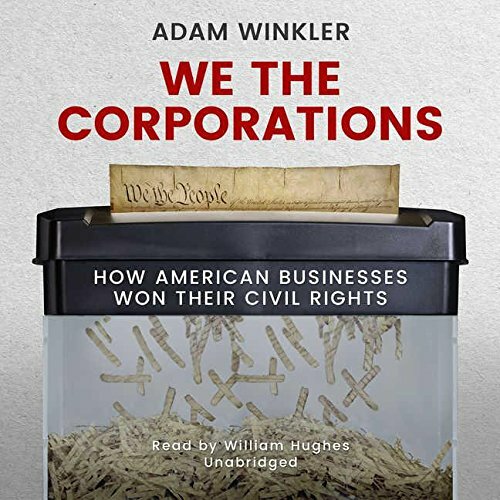 Synopsis: In this groundbreaking portrait of corporate seizure of political power, We the Corporations reveals how American businesses won equal rights and transformed the Constitution to serve the ends of capital. Corporations-like minorities and women-have had a civil rights movement of their own, and now possess nearly all the same rights as ordinary people. Uncovering the deep historical roots of Citizens United, Adam Winkler shows how that controversial 2010 Supreme Court decision was the capstone of a two-hundred-year battle over corporate personhood and constitutional protections for business. Bringing to resounding life the legendary lawyers and justices involved in the corporate rights movement-among them Daniel Webster, Roger Taney, Lewis Powell, and even Thurgood Marshall-Winkler's tour de force exposes how the nation's most powerful corporations gained our most fundamental rights and turned the Constitution into a bulwark against the regulation of big business. About the Author&colon; Adam Winkler, a professor of constitutional law at the University of California, Los Angeles, has been featured on CNN and in the New York Times, the Wall Street Journal, and the New Republic. A columnist for the Daily Beast, he lives in Los Angeles.